Assapora la bellezza naturale, paesaggistica e culturale dell'area circostante Bogotá in questo viaggio di un giorno che unisce le migliori attrazioni vicino a Bogotá durante una visita alla città di Zipaquirá. Inizia la giornata con il pick-up mattutino dal tuo hotel a Bogotá, proseguendo per 31 miglia (50 km) in una bella strada verso Zipaquirá per visitare la famosa cattedrale del sale della città. Aperta per la prima volta nel 1954 all'interno di una miniera di sale lunga 75 metri, questa imponente chiesa sotterranea è abbastanza grande da ospitare migliaia di visitatori. Dopo la chiusura nel 1991 per la ricostruzione, la cattedrale del sale fu ricostruita in grande stile, culminando nella rimozione di ulteriori 250.000 tonnellate (226.000 tonnellate) di sale dallo spazio. Fai una breve pausa dopo la cattedrale per il pranzo, dove potrai gustare una selezione di autentiche specialità colombiane, per poi proseguire verso Laguna de Guatavita, appena a nord di Bogotá. Questo pittoresco lago di montagna un tempo era un importante sito religioso per la tribù indigena di Muisca. Il lago raggiunse un'ulteriore prominenza durante l'era coloniale, quando un gruppo di spagnoli e stranieri credette che un tesoro di oggetti d'oro fosse nascosto sotto le sue acque, guadagnandosi il soprannome di "El Dorado". Termina la visita con una sosta presso la bellissima riserva di Tominé, la fonte di approvvigionamento idrico di Bogotá, e l'opportunità di acquistare lana locale, argilla e prodotti artigianali in oro, prima di tornare a Bogotá per il drop-off in hotel. We liked our full day tour. These places were very unique! The salt cathedral was empty when we were there. It was also much bigger than we had imagined. Lunch at the local place was delicious! A very unique and nice place to visit in Bogota, with history. Highly recommended. Great tour. Our guide, Juan, was knowledgeable and helpful throughout the day. The Laguna was awesome with a special park guide to tell the history. The Salt Cathedral was much larger than expected. Wear comfortable shoes and prepare for lots of weather changes rain, then sun, then rain again. This was mine and my husband's first time visiting Bogota Colombia and it was incredible! 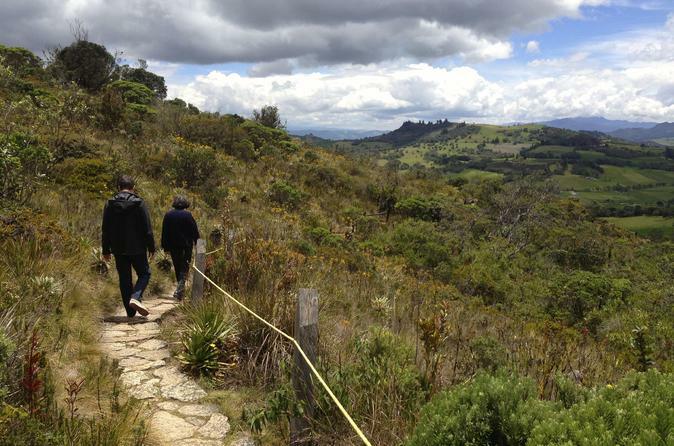 We stayed in the city of Bogota but also wanted to explore other areas outside of the city. 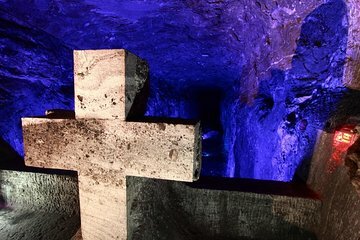 We chose the Salt Cathedral and Laguna de Gautavita tour because it took us well outside the city and because all reviews we read regarding this tour were very positive. Our tour guide was fantastic and so was our driver. They were both very knowledgeable and very easy to talk to. We were picked up on time at our hotel lobby. The entire tour from pick up to drop off was roughly 8 hours. We had a fantastic lunch which was included in the tour fee and we got to see some of the most amazing views I have ever seen. What a great experience!! This is a very good tour. The guide was very good and spoke good English. The Laguna was beautiful, but, it is a tough walk up there in the altitude. The Salt cathedral is beautiful and well worth a visit, as well. If you are going to Bogota, it is a don't miss tour. This was a great full day private tour. Our tour guide Patricia was knowledgeable and friendly. Interesting fact/legend tales at the laguna, picturesque. Great lunch, so tasty and with a friendly and helpful restaurant owner-vegetarian friendly. Salt Cathedral far exceeded expectations, its awesome! Wonderful tour with a very enthusiastic guide that made the day both educational and fun! It was an expensive tour so far we ever had but rewarding in the sense that it was unique and historical.